You can come out of exhaustion and feel relax with all the preparation in the room, including two big beds, mineral water for free, attached four delicate buffet breakfast, and bright separated shower area and dry area of imported shower facilities. All the fire fighting device and public safety facilities in the guest rooms are accredited by the government. The fireproof material is used carpet, curtain as well as compartments. Moreover, it has central air condition system, which can filter dust from the air. There are also full channel TV programs of Chinese, English and Japanese, Europe imported shower system, bathing daily necessities, fridge, mini bar-counter, boiling water machine, hair drier, mineral water for free, tea, cafe, and bathing articles. In addition, free WiFi internet access is also available at the hotel for your stay. 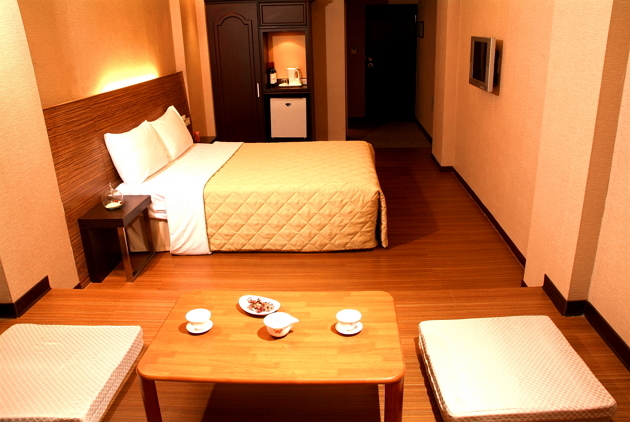 5.The room price includes sales tax and cleanliness expense. 6.If no additional bed, the third person who is taller than 110cm should be charged for NTD300 per person. That expense includes necessities and breakfast.